"You gotta have a parachute to drive this car." Think for a moment about what cars were like nearly a century ago. The most popular car back then was the Ford Model T. As the world began moving on from its longtime use of the horse, the era of the automobile was still very young, as was Zev Gitalis’ 97-year-old grandfather. The grandson is now a successful commercial real estate broker in Toronto, Canada, affording him the privilege of Tesla Model S ownership. 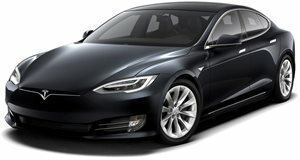 As you can imagine, the Model T and Model S couldn’t be more different. Perhaps they only things they share are seats, four wheels and a steering wheel. Heck, the Tesla doesn’t even need its steering wheel when in autonomous mode. But Gitalis figured it was time for his elderly and sharp as ever grandfather to experience the future. An explanation of electric cars in general, followed by a spin around town was all that was needed to bring this almost centenarian out of the past and into the future. "You gotta have a parachute to drive this car," was his near instant reaction to that instant torque. It must have been quite amazing (not to mention fun) for Gitalis to explain the Tesla’s range and charging capabilities to someone literally learning about this technology for the very first time. But this is also a perfect representation of just how far the automobile has come in less than a century.